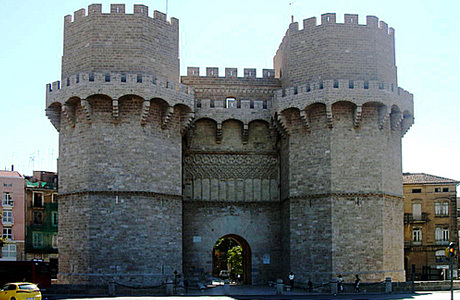 Serranos Towers, in Spanish “Torres de Serranos“, are one of the twelve gates of the ancient walls that made up the city. It is believed that the towers’ name comes from either the ancient route to Los Serranos, a regions of Valencia Community, or by association with the name of the main family living near the edific. The founders of the city awarded the construction of the Towers to Pere Balaguer, who was inspired by similar Catalonia constructions such as Puerta del Real Monasterio de Poblet. The building of Serranos Towers began 6 April 1392 and ended in March 1398. The Serranos Towers were used a defense mechanism against sieges and attacks. Although it was quite often that the towers were used for ceremonies and official inflows of kings and ambassadors. Serranos Towers has always been considered the main entrance to the city but after the fire of 1586, the construction was used as a prison. During the Spanish Civil War they became a deposit for the art works coming from Prado Museum. The towers currently serve the city in official ceremonies, such as ‘La Crida’ which is celebrated in the major Valencian holiday Las Fallas. If you are looking for places to visit in Valencia, don’t forget Serranos Towers.